Long-dead men crowd around – we’re not alone. Do their shadows, unseen, still cross my face? Borne on the wind from Time’s remoter shore? And know this – by their blood, you stand on hallowed ground. Let this proud stone in perpetual homage stand. For your Freedom they gave their all they had to give. Cedric Keith St. George Roberts. May, 1995. 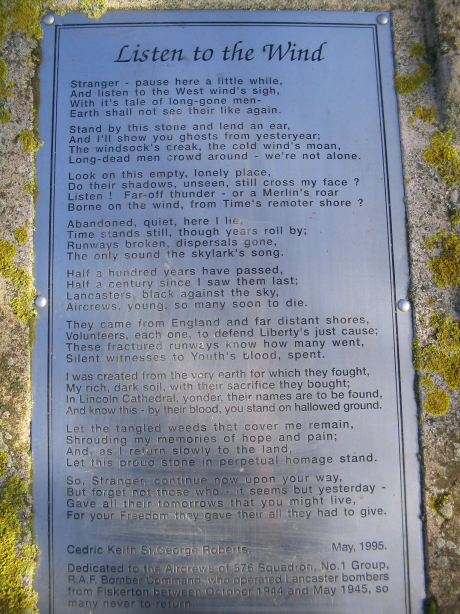 Dedicated to the Aircrews of 576 Squadron, No 1 Group, RAF Bomber Command, who operated Lancaster bombers from Fiskerton, between October 1944 and May 1945, so many never to return.